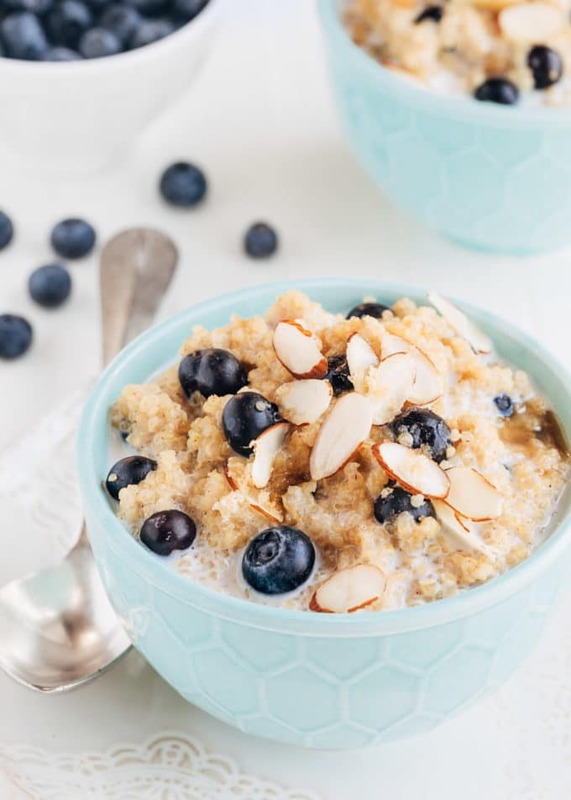 Packed with protein and nutrients, this hearty, gluten-free Breakfast Quinoa with blueberries, nuts, and brown sugar, is one of my favorite ways to start any day of the year. Visiting from Pinterest? This post was originally published in 2015, and updated in 2019 with new photos. New look, same great recipe! Every year around this time, I, like many, find myself in “resolution” mode (for the first few weeks of January, at least!). I’m sure my gravitation toward healthier choices right after the holidays has everything to do with sheer food exhaustion. After all of the sweets and multi-course dinners consumed in December, my body (and overstressed jeans) are naturally looking to eat a little lighter! I hate feeling deprived, so instead of radically changing my diet, I like to explore delicious, healthy dishes that I can make year-round. 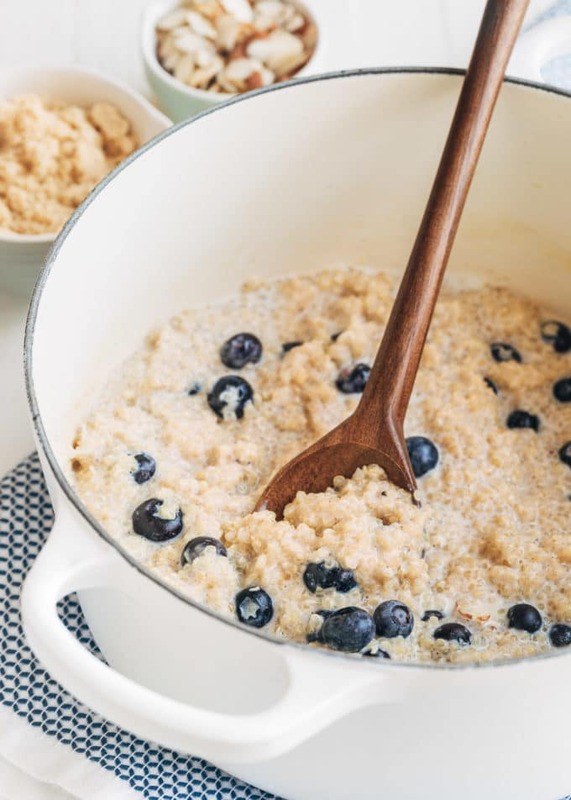 Blueberry Breakfast Quinoa is one of those recipes. Packed with protein and nutrients, this hearty porridge is a satisfying way to start the day. Don’t you just love when something you genuinely enjoy turns out to be good for you too? Jackpot! Quinoa (pronounced KEEN-wah) originates in the Andes region of South America. Many people think of it as a grain, but it is really a seed from the flowering Chenopodium quinoa plant. Quinoa seeds have become very popular over the past few years for their nutritional profile. The quinoa trend has been strong one! They’re naturally gluten-free, high in nutrients, fiber, and protein, and low on the glycemic index. 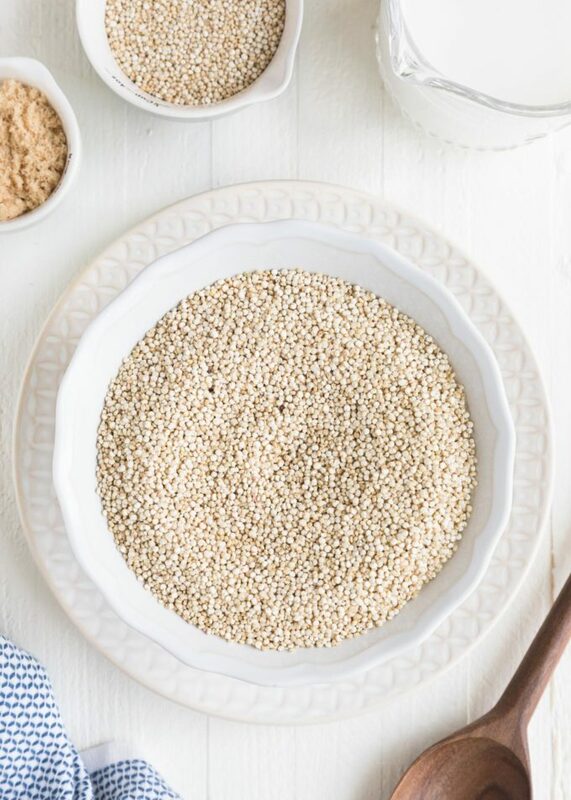 You’ll most often find quinoa in white, red, and black varieties at the market. Quinoa has a nutty flavor that varies in depth by color. The white variety is the mildest, and red and black are a bit earthier. Similarly, white quinoa is the fluffiest of the varieties when cooked, while black quinoa tends to have the most toothsome texture. Depending on the dish and the flavor and texture you’re going for, you can combine all three for a tri-color or “rainbow” quinoa effect. Quinoa is typically simmered, as you would prepare rice. It’s often added to savory recipes, like salads, sautés, and soups. I particularly love it alongside grilled or pan-seared meats and fish. When whole, quinoa seeds have an outer husk coated with a natural substance called saponin. This protects the seeds from the birds. While the husk is already removed when you buy commercial quinoa, some of the saponin can remain. It’s rather bitter, so it’s important to rinse the quinoa well before simmering it. I’d never thought to turn quinoa into a sweet breakfast porridge until a few years ago, when Martha Stewart made it on her PBS “Cooking School” show. I had a bag of quinoa in my pantry and gave the concept a try the next morning. When slowly cooked in a mixture of water and milk with a little brown sugar, cinnamon, and vanilla, quinoa seeds become a rich porridge with a soft bite. If you’re a quinoa fan, it’s a lovely alternative to oatmeal in the morning. You can easily adapt this breakfast quinoa to your personal tastes and dietary needs. I tend to prefer my quinoa on the softer rather than chewy side, especially in a sweet breakfast dish. So, I adjusted the seed-to-liquid ratio until I found the perfect texture for me. 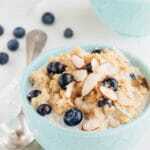 For a non-dairy breakfast, quinoa porridge is also delicious prepared with almond milk or coconut milk. Other flavor pairings I’ve enjoyed are sliced bananas with maple syrup, jumbo mixed raisins and cinnamon, and dried cherries with pistachio and cardamom (substituting my spiced Cardamom Milk in the cooking liquid). Once you have the base, the flavoring possibilities are nearly endless. 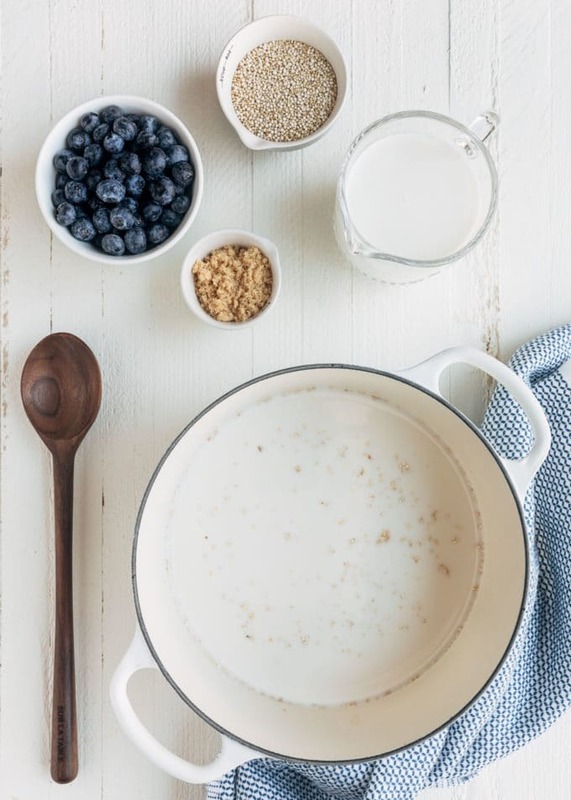 With cinnamon, brown sugar, vanilla, and sweet blueberries, this creamy breakfast porridge is tasty, satisfying, and good for you! In a heavy-bottomed saucepan, combine water, 1-1/2 cups milk, vanilla extract or paste, rinsed quinoa, and salt. Bring to a boil over medium-high heat (stirring occasionally and watching carefully so it doesn't boil over). Reduce heat to low, cover with lid slightly vented, and simmer for 15 minutes, stirring occasionally. Stir in 3 tablespoons brown sugar and the ground cinnamon. Re-cover and continue to simmer for about 5 minutes, until almost all of the liquid has been absorbed. Remove from heat and gently fold in blueberries. Serve, topped with extra brown sugar, warm milk, and nuts. I love to make my breakfast quinoa with almond milk. You are right, it’s so delicious! Thanks again for a great and informative article. I have a bag of quinoa that I have never used. Never thought to make it for breakfast. I really enjoy Quinoa and this sounds like an excellent breakfast alternative. Unfortunately, I have a very difficult time with the initial rinsing of the grain. I cannot find a strainer with small enough drainage holes and I wind up washing a lot of the Quinoa down the drain! Do you have any suggestions as to how to solve this problem? Hi Bob. I feel your pain; the first time I rinsed quinoa, my strainer holes (which I thought were a fine gauge) were too large and I lost many grains to the drain! I switched to an ultra-fine mesh strainer (such as this one, http://amzn.com/B000HVBES4) and it’s worked perfectly ever since. Another trick is to try lining your current strainer with a coffee filter. This will allow the water to run through while keeping the quinoa in place. Hope this helps!